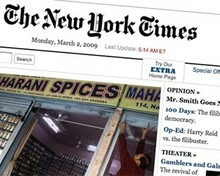 The New York Times is to launch two hyperlocal news sites in partnership with the City University of New York (CUNY) journalism school. The Local network will feature contributions from Times journalists, local residents and journalism students, Diane McNulty, executive director of community affairs and media relations at the Times, told Journalism.co.uk. The pair of sites, which go live today, will focus on issues affecting the 'everyday life' of citizens in the Clinton Hill and Fort Greene areas of Brooklyn and Maplewood, Millburn and South Orange in New Jersey. Locals will be asked to submit news announcements and tips, which will run alongside Q&As with community figures and features on local living, such as how to manage a small business during the economic downturn, McNulty said. CUNY students will work on the Clinton Hill and Fort Greene site and help teach residents about reporting and using interactive media, she added. The trainee journalists will blog about the project, while some students will be offered summer internships on The Local. "The sites are a pilot project, looking at ways to serve and engage audiences in new ways," McNulty said. Jeff Jarvis, associate professor and director of the interactive journalism program at CUNY, said in a blog post that funding is being sought to expand The Local initiative and offer hundreds of training courses in new media and journalism to the community. The sites will eventually carry advertising, though ad units are yet to be created, said McNulty. According to Jarvis, CUNY's business school will work with the Times on advertising on the sites. Local real estate listings will be provided via a map linked to information from the Times' property section.